Are you looking for reasonably priced elevation data over Chile that is ready for delivery now? 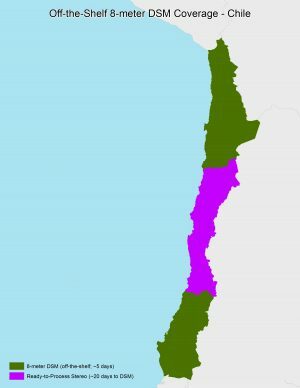 A map of the off-the-shelf 8-meter DSM coverage (in dark green) and ready-to-process stereo pairs (in purple) over all of Chile. If so, then we have the solution you have been looking for! Extracted from 50-cm stereo pairs collected by WorldView-1 and WorldView-2, this ready-to-download 8-meter digital elevation model (DEM) covers more than 300,000 square kilometers (sq km) of Chile. And in the parts of Chile without ready-to-download DSM data, we have the stereo pairs required to produce a DEM rapidly. For more information about the specific coverage we can offer and pricing of this 8-meter DSM, please contact the Apollo Mapping sales team at (303) 993-3863 or sales@apollomapping.com. This entry was posted in The Geospatial Times and tagged 8-m, 8-meter, chile, Elevation, featured products, The Geospatial Times, WorldView-1, WorldView-2 by Apollo Mapping. Bookmark the permalink.